Scruffy and stubborn as a mule, Escape from New York is probably a failure for director John Carpenter, but it is a treat for anyone else all the same. Carpenter has been vocal about his genre-DJ dreams of hopscotching from horror to action to Westerns to fulfill his inner-desires of throwing pebbles toward all outsider genres under the sun. More pragmatically, he sought new genres to avoid type-casting as a master of horror. Trouble is that Carpenter’s soul, despite his brain telling him otherwise, was a horror director, and his eye followed his soul. Even Carpenter’s best action material – 1986’s Big Trouble in Little China for one – doesn’t work so much as an action movie; it’s more a deconstruction of American action movie tropes that tickles the rib with how foolish American action movies could be. Whether or not that was Carpenter’s intent, the arguably accidental success of Big Trouble reveals a director who didn’t have much of an eye for conventional action directing, for his action directing was too sluggish and stilted to function as a serious work of the form. This entry was posted in Friday Midnight, Review and tagged John Carpenter, Kurt Russell, midnight screening on June 15, 2015 by jakewalters98. This week on Midnight Screenings, I’m looking at the two finest films from one of my favorite modern horror directors, and one of the men who brought midnight cinema to the mainstream: John Carpenter. Update early 2019: Never a fun time reading these college-age early reviews, especially when you don’t have time to write-up a new take in full, but I’ll say after a rewatch that Carpenter’s film remains one of the quintessential films in its genre, and its decade: a portrait of geographic seclusion as abyssal isolation that doubles as a study in the breakdown of democracy, all while replacing the proverbial conservative “Other” of horror with the Other within. It’s greatest trick, then, is that it turns one’s opacity to one’s own self into a truly terrifying dispatch from the fringes of society, both a final transmission from flickering-out ’70s ennui and an inaugural howl of ’80s malaise. And it achieves this inward turn, forcing us not onto an outsider but back onto our own frightening selves, without ever resorting to any “psychological horror” tools to launder the horror by ensconcing it only within one character’s head-space. Truly disquieting stuff. 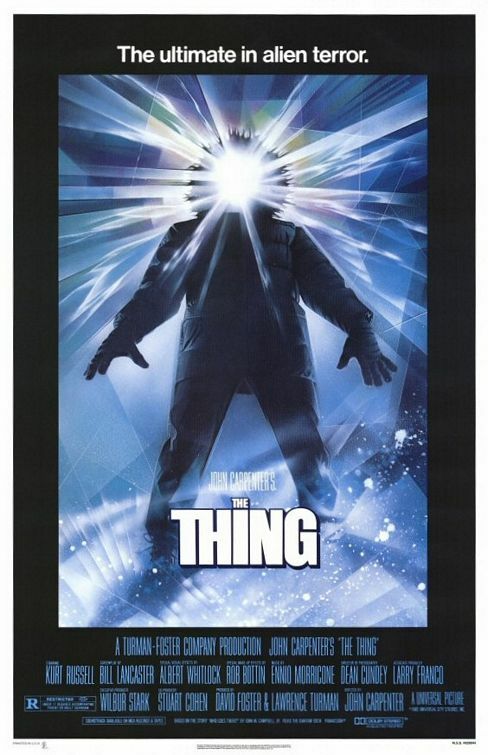 John Carpenter’s recently re-appraised The Thing works on many levels. But most fascinating is that it works in a way completely, and seemingly intentionally, divorced from Carpenter’s other horror-masterpiece, Halloween. As I am not the first to observe, his 1978 game-changer centers an almost eternally faceless horror that can infiltrate mundane suburbia at a moment’s notice, like an ever-present shadow we’d prefer not admit is there. In The Thing, the horror belongs all too well. It’s not faceless. It’s quite the opposite: it has “the” face, in that its face is humanity, or rather, as I’m not the first to notice, it has any face. And not in a metaphorical “we’re the monster after all” sense, although that atavistic stone can be overturned for those looking. It’s primarily interested in something more earthy and visceral that is nonetheless profoundly human and lonely. The monster’s face is quite literally the human face – it enters into the human body and takes it over while occupying the human form. In doing so, perhaps as a none-too-happy accident, it causes us to question our very identity. This entry was posted in Friday Midnight, Review and tagged horror films, John Carpenter, Kurt Russell, midnight screening on July 26, 2014 by jakewalters98.